Salt Lake - Efren Navarro continues to be a solid player for the Bees. He racked up 5 hits over the weekend, including a home run and a triple. His OPS now sits above .800, and with his defense, he could be a good option off the bench for the Angels. Jeremy Moore also had 5 hits, and he projects to be a bench player as well, at least until he cuts down on his strike outs. Alexi Amarista is having a rough month, but on Sunday he hit an inside the park home run, which is kinda cool. Reliever Jeremy Berg seems to have corrected his earlier flaws. After a stint with double-A to fix himself up, he has had 2 very good outings with Salt Lake. The 25 year old put up ridiculous stats in 2009 and 2010 after he was signed as a free agent. Michael Kohn continues to seriously struggle. His ERA has now ballooned to 4.57. Arkansas - Luis Jimenez was having a good week end until his 0-5 on Sunday. Still, he his hitting .382 in his last 10 games, with an OPS of 1.028 and much improved defense. On Friday, most of the Travs talented pitching was on display against Corpus Christi. Christian Scholl started and went 6 innings, allowing just 1 run, striking out 5 and walking 1. Then Loek Van Mil came in and threw 3 scoreless innings lowering his ERA to 1.94. Steven Geltz was next, tossing 2 shutout innings, striking out 3. Finally, David Carpenter collected his 4th save, and still hasn't given up a run in double-A. I doubt we will see him in September, however, as he has only thrown 16 innings above A+ ball. Cedar Rapids - Looks like Randal Grichuk may have turned himself around. He is 4 for his last 10 with 2 triples and a double. If he has a very good last couple weeks, he could start 2012 in Inland Empire. Reliever Beau Brooks has a 2.90 ERA now in his first season in the organization. Not much else to report from CR, as it is somewhat of a dry spot for prospects right now. Orem - Taylor Lindsey is absolutely ridiculous. He is now hitting .374 overall, and .400 in his last 10 games. His 1.051 OPS leads the Owlz. Don't be surprised if he skips Cedar Rapids next year, and jumps to IE. Kaleb Cowart has fallen off the face of the earth and his average is now below .300. Lefty hitting catcher Abel Baker is still having a very good year. His .310 average and .412 OBP really stand out for a 20 year old catcher. Lefty starter Ryan Crowley has been very good lately. After a rough start, the 20 year old Crowley has allowed just 1 run in his last 10 innings pitched. 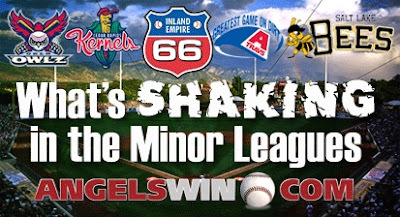 The 2012 Kernels/66ers will be extremely talented when this tremendous group of prospects moves up. AZL Angels - Jean Segura is rehabbing for the AZL Angels. In his first game he played 5 innings, second game 7 innings and the plan is for him to play 9 tomorrow and then hopefully join IE within the next couple of days. Outfielder Andrew Workman out of ASU is very hot lately, hitting .368 in his last 10. Workman has a .388 OBP. Powerful third baseman Joseph Krehbiel is, for some reason, being converted to a pitcher. Lefty Stephen Tromblee (sweet name) has a 2.91 ERA in relief and has walked just 3 batters, while striking out 3. DSL Angels - The DSL Angels played just 1 game over the weekend, and it was play the young guys day. None of the hitters decided to hit, so we can just skip that part of the ball. 20 year old Gabriel Perez went 4 shutout innings, lowering his ERA to 1.47. 18 year old Jose Reyes (WE GOT HIM) has a 1.08 ERA in relief. 19 year old Orlando Ramirez has a 1.42 ERA in relief. This is Ramirez' 2nd straight great year.